The University of Maine College Democrats hosted Lewiston-based legislator and candidate for Congress Jared Golden in the Coe Room of the Memorial Union on Thursday, Oct. 4, giving a politically-diverse group of students the opportunity to speak with him about his stance on issues of common interest. Golden, a Democratic Representative in the Maine House Representatives, is running for a seat in the U.S. House of Representative against current Republican incumbent Bruce Poliquin. This race has drawn national attention as Golden vies for Poliquin’s position in the upcoming Nov. 6, election, a reflection of the national trend of Democrats seeking to out-seat Republicans to retake Congress. Golden has has found popularity for his bipartisan views on issues from gun control to women’s health. He’s been known to fall in the middle of controversial issues, working to pass bipartisan bills while in the Maine House. He recently worked with Republican Gov. Paul Lepage to pass a law allowing military veterans returning from conflict to take the nursing exam without the prerequisite education requirement. However, the base of his political beliefs are rooted in the Democratic Party. He refers to himself as an “old-school” politician and “labor democrat” because he believes in focusing on meeting with voters in person and talking to them about their concerns. Golden’s opponents have criticized him for being too liberal and unsupportive of the Second Amendment. A super Political Action Committee (PAC) with Republican influences, called the Congressional Leadership Fund, has been taking aim at the candidate with attack ads since late August. UMaine is seated in the 2nd Congressional District of Maine, which had an unbroken streak of voting Democrat in presidential elections from 1992 to 2012. In 2016 — President Trump’s election year — the 2nd District voted Republican for the first time in 20 years. Golden has been using his time in the Marines as a campaign platform. He talked with students about the skills he learned while serving that will help him in a leadership role and how it will help him work across party lines, if elected to the U.S. House of Representatives. 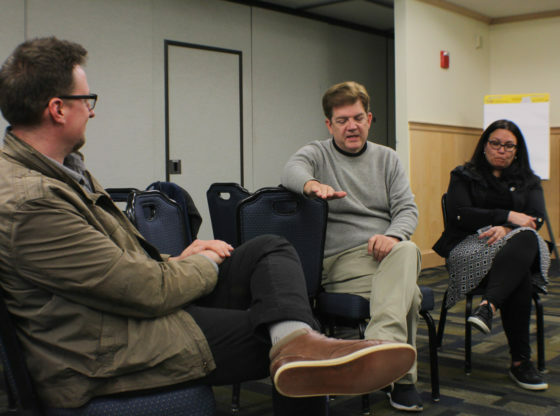 The event remained civil and respectful while Golden addressed opposing views from some of the UMaine College Republicans sitting in the back of the Coe Room who challenged a few of his positions. David Scidmore, a bioengineering student at UMaine, is a registered Libertarian and Maine voter who attended the event. He shares some opinions with Golden but thought he was evasive on some of the questions that were asked during the evening. “I felt he dodged questions that were important to me, which are reducing the national deficit and smaller taxes,” Scidmore said. Kevin Fitzpatrick is a political science and sociology student at UMaine who considers himself a “friendly Democrat” and thinks it’s important to get out and help get people elected. He appreciated how Golden treated opponents with respect. “I thought he was very charismatic. I thought he was very humble. I like that he is willing to reach across the aisle,” Fitzpatrick said. The event was organized in part by economics and political science student Keegan Farrington, who is a member of the College Democrats and an intern for the Golden campaign. 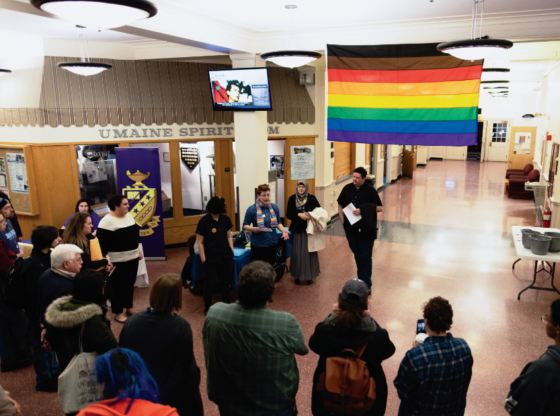 In an email, Farrington praised UMaine’s strong culture of student activism and important voting demographic as the reason why political candidates often make an appearance on campus. Golden is not the first political candidate to come to campus. In early March 2016, then-candidate for the presidency Ted Cruz of Texas drew a crowd of more than a thousand at a rally in UMaine’s Collins Center for the Arts. Elections this year will be held around the nation on Nov. 6. In addition to congressional contests, voters will decide on the position of governor, which is currently contested between Maine business owner Shawn Moody, Maine Attorney General Janet Mills and independents Terry Hayes and Alan Caron.